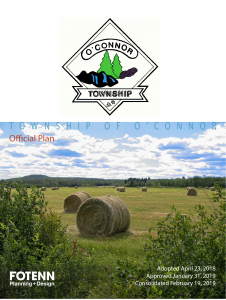 The Township of O’Connor’s Official Plan has been approved with modifications by the Ministry of Municipal Affairs and Housing on January 30, 2019. Council will now be reviewing the Township of O’Connor’s Zoning By-law and a public meeting will be held in the near future. Please watch your Cornerstone and this website for more detail. The Township of O’Connor is currently reviewing it Official Plan and Zoning By-law. An Open House was held on Saturday, June 25, 2016 from 1:00 p.m. to 3:00 p.m. If you were unable to attend and would to review or have copies of the draft documents and the power point presentation please click on the links below or come into the municipal office for a paper copy. Comments, Questions or Concerns will be accepted throughout the process, however if you would like to have your comments considered prior to the submission to the Province, please submit them to the municipal office by Monday, July 11, 2016. Please include your name and contact information with your comments. The Township of O’Connor is located within the Planning Area of the Lakehead Rural Planning Board in the District of Thunder Bay in Northwestern Ontario. O’Connor is located west and south of the City of Thunder Bay and is bordered by the Township of Gillies to the south, Municipality of Oliver Paipoonge to the east, Marks Township to the west and by the Township of Conmee to the north. The Township is located in an area of the Province that has a unique history of development and economy based on the natural environment. The Township can be described as an area of rural development exhibiting a “rural” lifestyle having a local economy based on natural resources. The protection and maintenance of the rural environment is important to the residents of the Township. The concentration of development into distinct settlement areas is not a desired development pattern. The Township as a whole is considered to be a rural “settlement” area by the residents. A review of the Township of O’Connor’s Official Plan and Zoning By-law is currently under way. Fotenn Planning has been hired to undertake the review. A Open House will be scheduled for some time in May. If you would like more information on this review please contact the Township office at 476-1451 for more information. Please watch the website and the May issue of the Cornerstone for more detail.